Steel buildings offer consistency, strength, durability and speed. The stability of steel means there are no contraction or expansion issues associated with moisture changes, so frames won’t warp, twist, sag or shrink and this reduces costly callbacks and cost overruns. Light steel framing is 100% recyclable and is designed to stand the test of time. 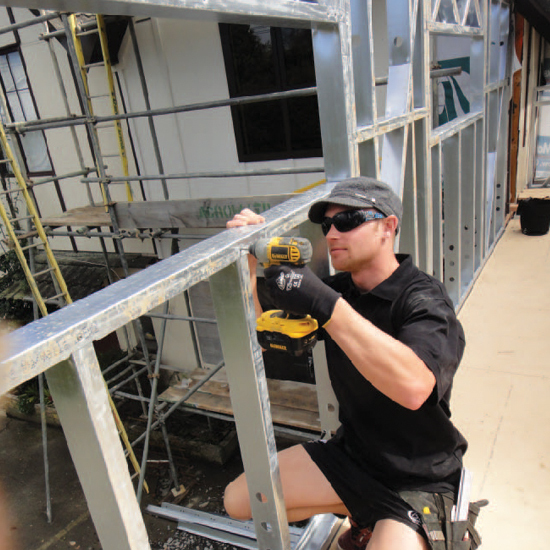 NZ Framing frames are galvanised and come with a 50 year durability statement. Steel framing has been extensively tested for its capacity to withstand earthquakes up to 9 on the Richter scale and has consistently proven to stay straight, true and safe . Because steel doesn’t need treating with chemical preservatives and won’t give off gases or emit VOC’s, it’s also safer for people handling and living or working around it. Framing supplied by NZ Framing is pre-assembled, strong and straight, and is clearly identified with all sections printed. On-site, the pre-fabricated frames are very light and require less people or equipment to lift in to place, and extremely accurate, which reduces on-site delays. The frames don’t absorb moisture, so there is no delay waiting for frames to dry. Service holes are already pre-punched, so sub-contractors can also get in and out much quicker. Steel is up to 70% lighter than timber. On site steel framing can be constructed faster than timber, frames can be passed up easier and it can be erected with reduced need for heavy lifting machinery, making it ideal for difficult sites. The lightness of steel framing means that a frame can be moved into place by only two builders, reducing the cost of labour and number of people required on the build and can reduce health and safety issues related to heavy lifting. Steel is a good choice for additional construction on existing buildings (timber or steel buildings) because it is light weight. How does building with steel save time? It’s very light and extremely accurate. Readymade frames can be lifted into position and fixed very quickly. The frames don’t absorb moisture, so there is no delay waiting for frames to dry. Service holes are already pre-punched, so sub-contractors can also get in and out much quicker. Do builders need special training to use steel framing? Steel frames can be erected by almost any builder and if required we can offer guidance to help a builder who is new to steel framing. Wall linings, kitchens and internal cabinets are easily fitted and the high build quality means fewer builder call backs. Is steel more expensive than timber? Steel framing is a complete design and build system and depending on the design is similar in cost to timber framing and the final constructed cost will be the same or less for a house of comparable size and quality. Why is steel healthier to live in? Steel doesn’t absorb water, warp, expand, rot, or grow mould. It doesn’t require poisonous preservatives and chemicals associated with timber treatments. It does not harbour mould or mildew and is impervious to rodents like mice and rats. Will there be any issues getting a building consent? Steel is now a mainstream product and councils are familiar with consenting plans for steel framed homes or buildings. Using steel framing will not change the cost of the building consent. NZ Framing is able to assist your team throughout this process and can supply fully detailed and engineered drawings for your consent. 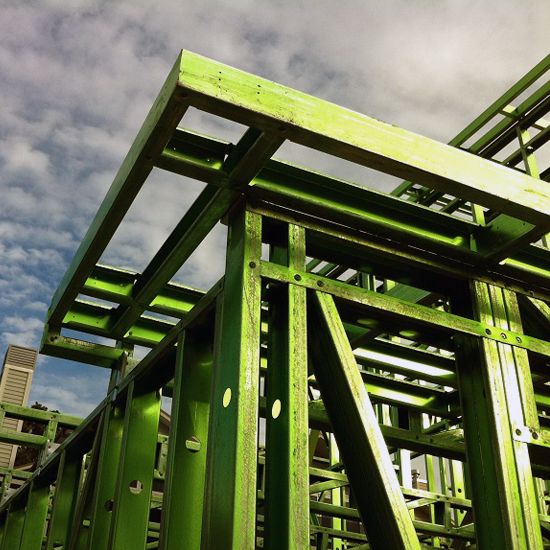 Is steel framing suitable for non residential buildings? Light steel framing is commonplace in commercial construction and is mainly used for non loadbearing partitions. 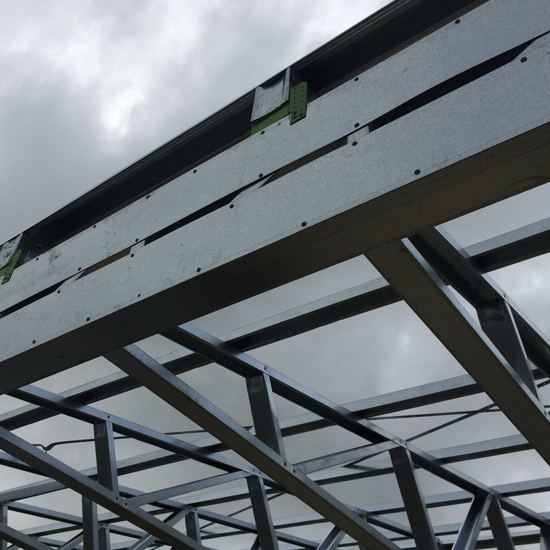 Steel framing from NZ Framing can be specifically engineered for load bearing situations or tall walls that have specific design requirements e.g. deflection. Is steel framing an option for renovation or extension of existing buildings? Yes, steel framing can be used for renovations and alternatives on either a timber frame or a steel frame building. Moving walls that are load bearing require a building consent whether steel or timber is used and generally the principles are the same. The advantage of the steel wall is that it can be disassembled and reassembled in the new position – often with just a screw gun. Can I convert my house plans from timber to steel? Converting house plans from timber to steel is relatively easy. The NZ Framing design and detailing team will be able to help you with this process.